Terry is a Professional Engineer with a background in hydraulic modeling, remediation, dam safety, and stormwater pollution prevention. She is MAD’s first P.E., but it’s not the first time she has worked for us! Interestingly, Terry originally worked with MAD as an intern in 2011 while transitioning to a new career field. She is a welcomed addition to our team, and we look forward to tackling new projects together! 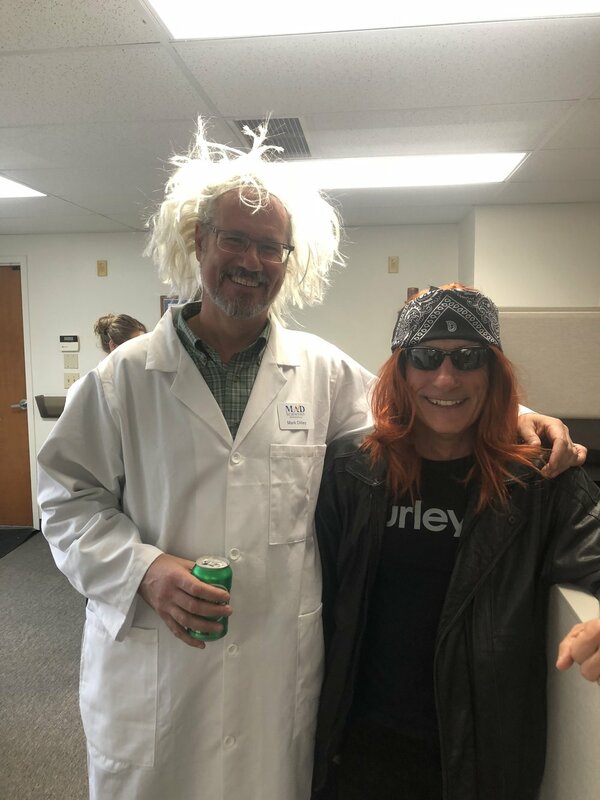 MAD Scientist Associates Celebrates two decades! But on Sunday (believe it or not), our company turned TWENTY! It’s no joke! We’re TWO decades older, TWO decades stronger, TWO decades wiser, and still MAD about the environment after all these years! We’ve been fortunate to have had valued clients and a superb, growing team who have made all these years of hard work and dedication in environmental consulting and conservation both fun and fruitful. More information about events to commemorate our milestone of 20 years will be forthcoming. Stay tuned to MAD Scientist Associates’ website and social media! MAD Scientist Associates teamed with CT Consultants to develop a plan to improve Lucien M. Clemons Park in the Lake Erie coastal community of Marblehead Village. MAD’s role was to design the ecological restoration plan for the park, with an emphasis on native Lake Erie shoreline plant communities. CT Consultants designed the park’s amenities and general infrastructure to benefit park visitors. The park will likely be built in phases, as funding is secured. Once complete, the park will be completely transformed. And as one of the few reaches of shoreline that will be publicly accessible, the park usage is expected to be very high. The presentation to the Village council of the conceptual plan for park was attended by a reporter from Port Clinton’s newspaper, The Beacon. You can click here for the full story. As majority owner, Christine Dilley was approved to renew MAD’s Woman Owned Small Business (WOSB) and Woman Business Enterprise (WBE) certifications as well as the company’s EDGE certification. The WBE/WOSB certifications are utilized by thousands of major U.S. corporations and federal, state and local government entities nationally. EDGE (Encouraging Diversity, Growth and Equity Program) is a state of Ohio recognized certification that supports disadvantaged businesses. We are pleased to have this state and national support to allow us to better serve our clients and teaming partners in meeting their needs and goals. Mark Dilley’s Professional Wetland Scientist (PWS) certification was also renewed. 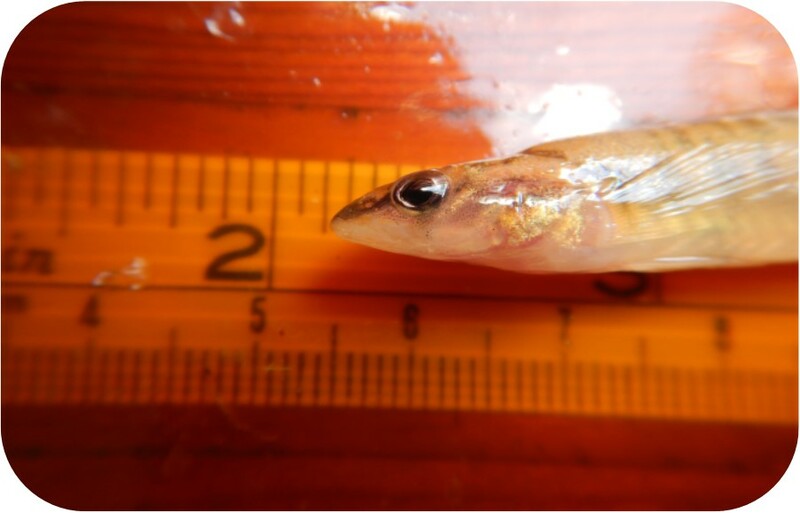 As a PWS, Mark will continue to exemplify high standards in the practice of wetland science. 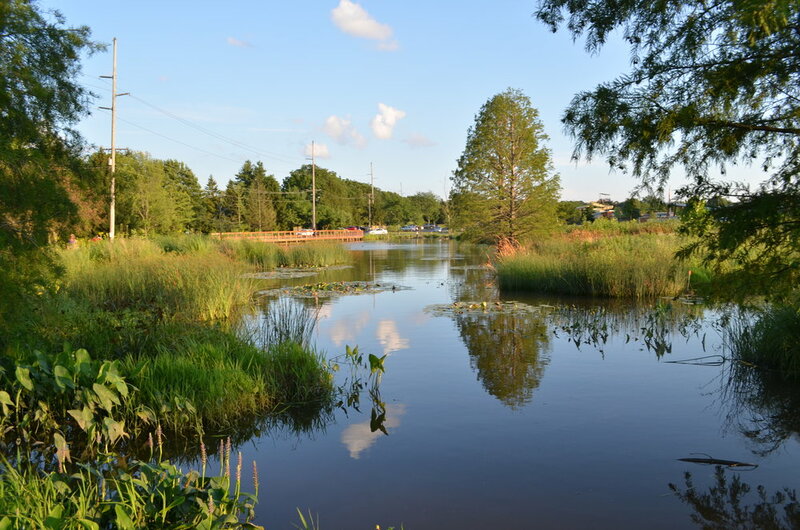 This certification signifies that, in the eyes of his practicing wetland professional peers, Mark has continued to develop his wetland career through training, teaching, and taking on leadership roles in the wetland profession. Further, it confirms his dedication to the PWS code of ethics. This certification provides clients peace of mind, knowing they can entrust Mark’s training and oversight of our team of wetland scientists. 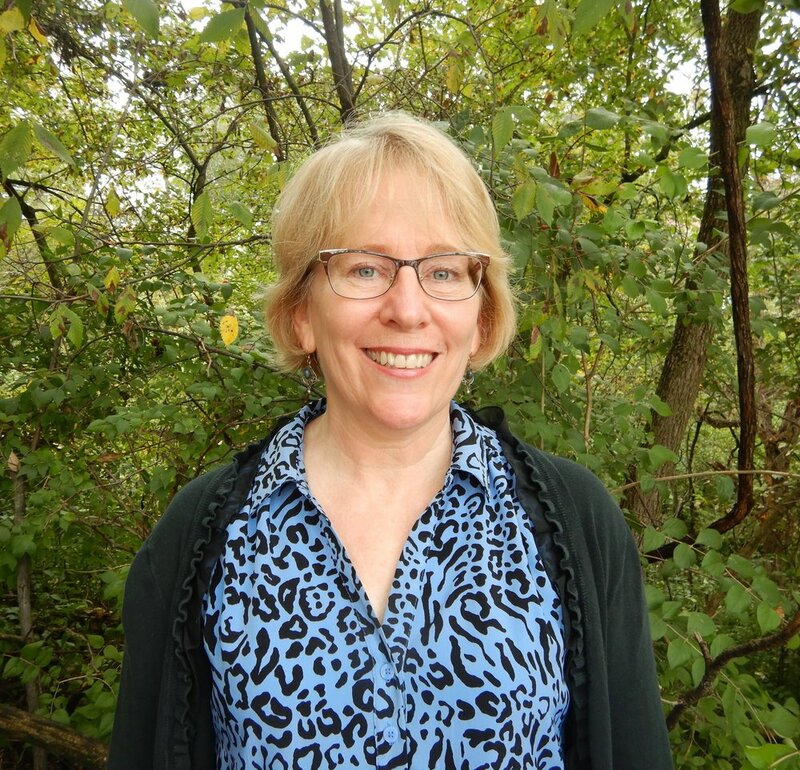 MAD associate Jenny Adkins was recently nominated for the position of Secretary with the Environmental Education Council of Ohio (EECO). She will be inducted as an officer at the annual conference to take place April 14 at the Maumee Bay State Park Lodge just east of Toledo. MAD Scientist Associates has long attended and presented at EECO conferences and we look forward to strengthening connections through Jenny’s participation as Secretary. EECO is a non-profit organization whose mission is to promote and facilitate environmental education for a more scientifically literate population, resulting in a healthier environment. Members include formal and informal educators, businesses, state officials, students, and individuals. They strive to connect environmental professionals with educators and students seeking expertise and to raise career awareness. If you are interested in learning more about EECO or would like to attend the upcoming conference, contact Jenny or register here. We also encourage our friends and colleagues to donate generously to this reputable organization. Directly or indirectly, environmental education is the reason that there are environmental careers! Educating the next generation is key to a brighter and more livable future. Our firm takes its environmental responsibilities seriously, and we’re making continual improvements to become more sustainable. MAD Scientist Associates has confirmed this commitment by becoming part of Columbus’ GreenSpot program. GreenSpot, now with more than 17,000 members, is a citywide effort to have businesses and individuals “go green” to help create a healthier and more environmentally-conscious Columbus area. “As a company, we’ve always adhered to the values exemplified by GreenSpot, but now, as a member business, we can reaffirm our environmental ethic and publicly support the Go Green efforts of this organization to help create a cleaner, healthier and more sustainable Columbus and central Ohio area,” said MAD associate Jenna Odegard. GreenSpot offers support and suggestions to help its members make the workplace more “green” while decreasing their carbon footprint, and MAD intends to implement as many of these suggestions as possible. This is another way to show the communities in which we work that our company is serious about maintaining the health of our global environment — by taking action at the local level, especially in Westerville and Columbus. As a member of the program, MAD will be added to the GreenSpot website. On this website, like-minded businesses and individuals can find a list of resources, including a toolkit containing a media release, a template message to help spread the word to colleagues, forms to pledge environmental consciousness and more. If you or your business are interested in becoming more sustainable, we recommend you visit www.columbus.gov/greenspot to learn more! 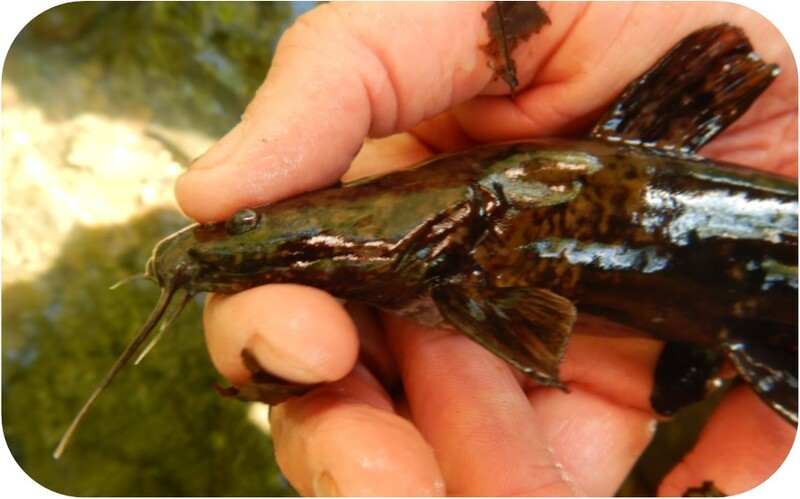 Mark Dilley spent the last few weekends in March presenting at workshops held by the Ohio Vernal Pool Network (OVPN) and the Ohio Wetlands Association (OWA). As President of the non-profit OWA, Mark was responsible for presenting on the topic of the "Flora of Vernal Pools." MAD staffer Jenny Adkins played a key role in developing his presentation. Both are continuing to make improvements to this training module based on feedback from workshop participants. The presentations took place at Stratford Ecological Center in Delaware and the Brukner Nature Center in Troy. These workshops were conducted to beta-test a "train the trainer" presentation package that is being developed with funding support from an Ohio Environmental Education Fund (OEEF) grant from Ohio EPA. 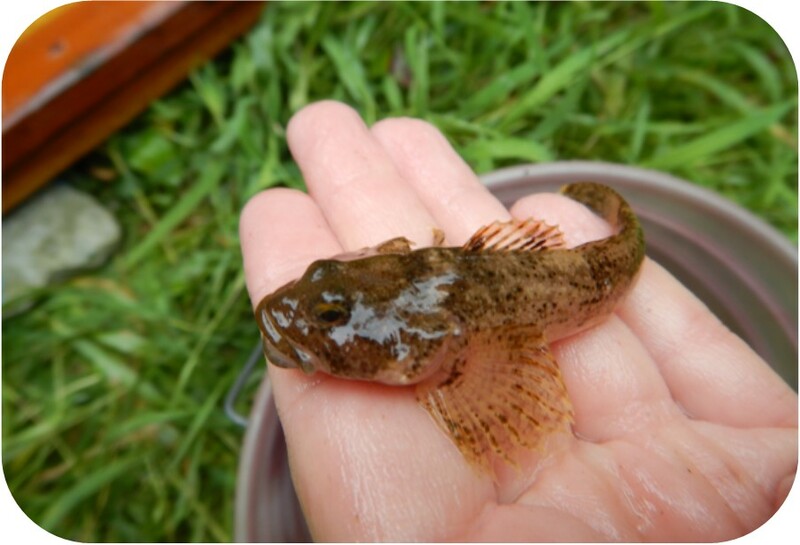 The overall goal of the training is to encourage citizen scientists to better understand and appreciate the ecological importance of vernal pools and contribute to their monitoring and protection. 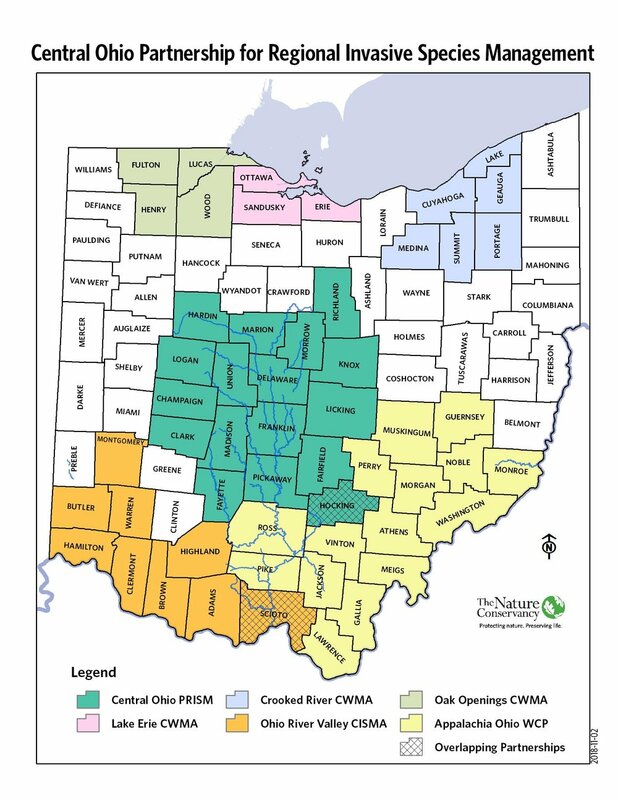 The OVPN is a collaboration between the Ohio Wetlands Association and the Midwest Biodiversity Institute. As Chair of the OBS Board, Mark led the process of hiring a new Executive Director for the organization in the weeks leading up to the conference. At the conference, had the opportunity to welcome more than 200 participants, and introduce the new Executive Director, Dr. Connie Hausman, the first female director of OBS. The group photo shows the current board, as well as two award recipients, Dr. Charles McClaugherty and Emliss Ricks (back row, center, left to right) that were honored at the event.Follow these links to learn more about OBS and the ONHC. 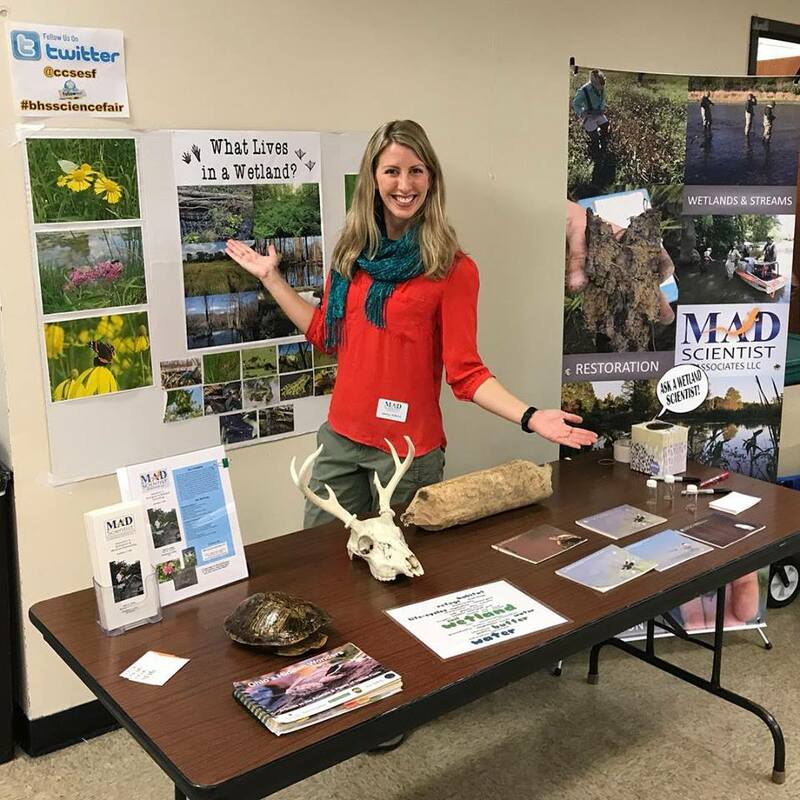 Mark Dilley and Jenna Odgard assisted with the Vernal Pool Extravaganza event, held on March 11 at Rocky Fork Metro Park. 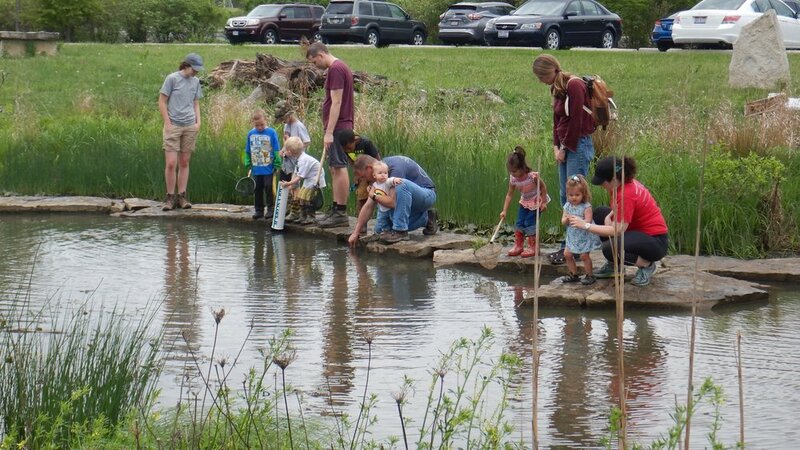 Though the weather was less than ideal for a wetland exploration, the event was a huge success, with many families and individuals coming out to learn about the wonders of vernal pools. Our team worked alongside Mick Michacchion from the Midwest Biological Institute, and several Metro Parks Naturalists to guide the group through an emergent marsh and a constructed vernal pool to retrieve funnel traps and look for signs of life in early Spring. Attendants were thrilled to see mole salamanders and wood frogs that braved the frigid temperatures to visit their seasonal breeding sites!